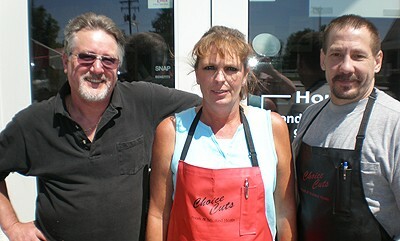 Choice Cuts was established in 1997 at a small butcher shop in Caldwell with the money from Stark’s 401K. His gamble turned out to be a success and today Choice Cuts has become a well established business in the Boise area. Butcher shops aren’t as common as they used to be but, the customers like coming to a full-service shop, that offers everything from beef, pork and chicken to smoked hams and jerky. Customers are often drawn in by the aroma permeating the shop, where jerky , salmon, ham and turkey are being smoked. On Saturdays the smoked barbecued back ribs are a big hit. Choice Cuts also sell the American made smoker grills (Memphis) as well as a large stock of pellets and barbecue sauces and rubs.